Next week we will release Episode 2 of The Adventures of Fearless Fortissimo. The story and the music promise to be more exciting than ever! But before we can reveal any more… Can You Help Us? We want to know how you would like The Adventures of Fearless Fortissimo to be released. Episode 1 was released as a downloadable eBook. This format certainly has advantages; the most important being the ability to print multiple copies and receiving all 3 levels of the book upon purchase. 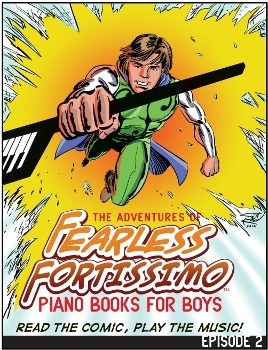 But… we have also had many people request The Adventures of Fearless Fortissimo in hard copy. While you won’t be able to acquire all 3 levels for a single purchase, the cost of a single level will be less than the “all-in-one” eBook. Purchasing hard copies also means it is much easier to recover your cost of purchase by reselling the music to your students in comparison to the ebook versions. In addition, hard copy means you won’t have to print the music books yourselves. So I guess it comes down to this… do you want something that you can resell to your students and that they can physically hold in their hands or do you want something that is an “all-in-one” convenience, allowing you to print when needed? Would you mind clicking the link below and answering our “one-question survey”? The results of this survey will determine how we will release The Adventures of Fearless Fortissimo next week. Click here to take the survey. Thanks so much!